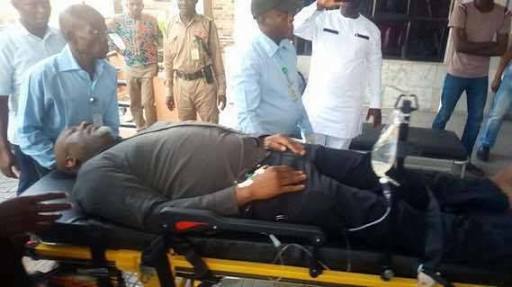 Heavily armed policemen have taken position at the Abuja hospital where Sen. Dino Melaye is being treated after he allegedly jumped out of a moving police vehicle and sustained an injury. A team of policemen trailed Melaye yesterday and re-arrested him after he allegedly escaped. According to a statement by the Force Spokesman, ACP Jimoh Moshood, Melaye escaped from lawful police custody while being taken for arraignment in Federal High Court, Lokoja, Kogi State from Abuja. Moshood alleged that hoodlums and miscreants in two Toyota Hilux vehicles blocked the police vehicle conveying Melaye around Area 1 roundabout and took him to an unknown destination. “The Police team re-enforced and trailed Sen. Dino Melaye to Zankli Hospital, Abuja, where he was re-arrested. “The Senator would be arraigned in court without further delay," he assured. Moshood said that one of the Toyota Hilux vehicles used by the hoodlums and miscreants in aiding the escape of the Senator had been recovered by the police investigation team. He said the Inspector-General of Police had directed a thorough investigation into the circumstances leading to the rescue and escape of Melaye from lawful custody.